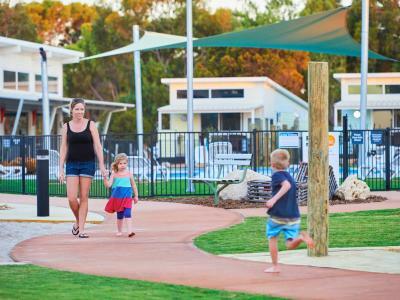 Lock in a great price for RAC Cervantes Holiday Park – rated 9 by recent guests! Our unit was great for travelling with old folks. Well equipped kitchen . Hugh hall/dining for group of 5 adults. 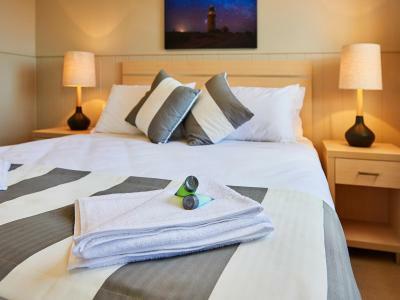 Would be great if there is washing machine and dryer within the villa as well as electric blanket (for winter period ). The cabin we had was very new and very nice. We had the 3 bedroom, which came with 2 bathrooms as well. The pool area looked very inviting though it was too cold to swim. The beach by this facility had a TON of seaweed at the time we were there. This was a good location to be in Cervantes so we could go to the Pinnacles and to see the stromatolites. We had some delicious seafood in the area too. Amazing stay, beautiful lot. BBQ facility at your own veranda, we loved it. Very clean. 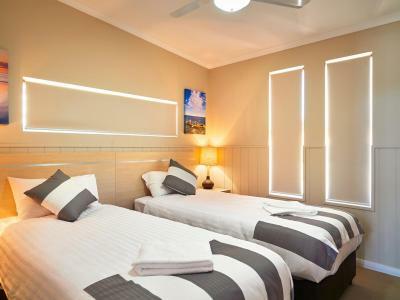 Friendly staff, great family quiet atmosphere, next to the beach and very close to the Pinnacles desert. Would recommend to anyone stopping for an overnight or for a relaxing stay in the area! 2 Bedroom Villa was comfortable and clean. Bed in master was great. TV on the wall in the robe and air con. Lovely hot shower. Separate toilet that had it's own handbasin was great. Good size fridge. Great oven in the camp kitchen. BBQ on the verandah was brilliant. Nice table and chairs on verandah but it was too big for the area and you couldn't easily pull chairs out. Beautiful pool area. Water was cold though. Lovely cafe on site. The accommodation was clean and spacious for a family of 6. The pool and park were great for my kids. Fantastic accommodation, great location, great design and layout we absolutely loved it decided to stay for an extra night. Great location, well set up and secure. Good atmosphere and very helpful and friendly staff. Breakfast at cafe on site was a bonus for those just doing an overnight stay. Beautiful, bright and comfortable modern style house located next to the pool of the holiday resort. All what you need for a comfortable holiday is present. The house has outdoor seating with its own bbq. Parking at rear of property. Good breakfast and lunch can be bought at reception/ cafe of the holiday park. Good after hours assistance when arriving outside opening hours. 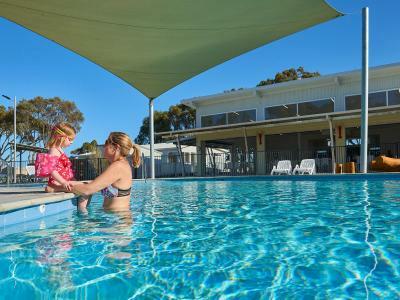 Boasting a large garden and outdoor swimming pool, RAC Cervantes Holiday Park offers modern accommodations in Cervantes. 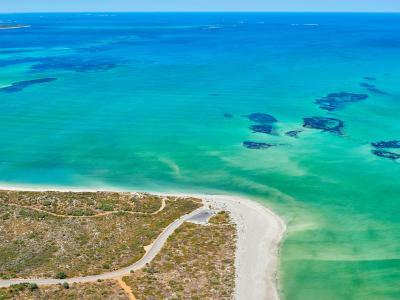 Jurien Bay is 14 mi away. Free WiFi and free private parking are available on site. Each of the modern 2 and 3-bedroom villas features a fully equipped kitchen, large living room and private bathroom facilities. 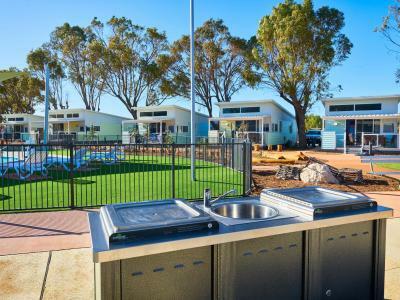 Guests have access to on-site laundry facilities, a large camp kitchen and range of BBQs located throughout the property. 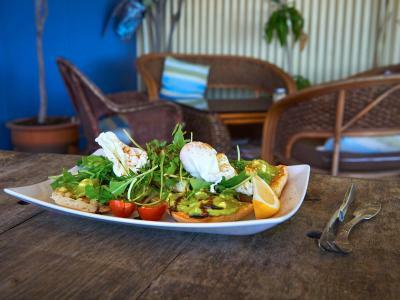 You can enjoy a meal at Seashell’s Café, which is open daily for breakfast, lunch and light snacks. The property also offers packed lunches. This property also has one of the top-rated locations in Cervantes! Guests are happier about it compared to other properties in the area. This property is also rated for the best value in Cervantes! Guests are getting more for their money when compared to other properties in this city. When would you like to stay at RAC Cervantes Holiday Park? This modern 2-bedroom villa is located overlooking the large pool area and activity center. 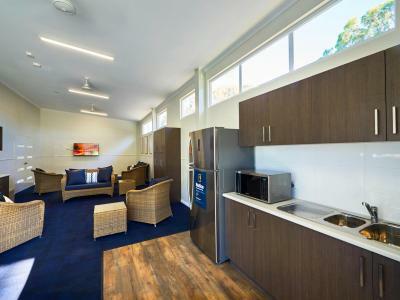 Enjoy the large kitchen facilities containing a fridge, microwave and cooking utensils. 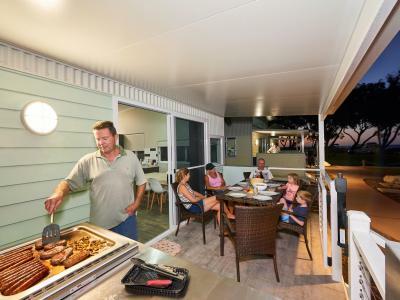 There is a spacious living area and a BBQ located on your private veranda. This modern 3-bedroom villa is located overlooking the large pool area and activity center. 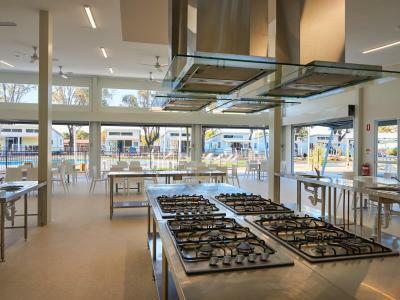 Enjoy the large kitchen facilities containing a fridge, microwave and cooking utensils. 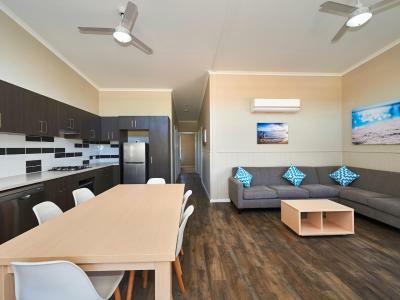 There is a spacious living area and a BBQ located on your private veranda. This air-conditioned villa overlooks the pool and is close to facilities. This accessible villa includes a ramp and has accessible fixtures and fittings. It has one queen and two single bunks. Also features a lounge, dining area and kitchen with fridge, stovetop, oven and microwave. There is a bathroom, veranda with outdoor dining and BBQ facilities. 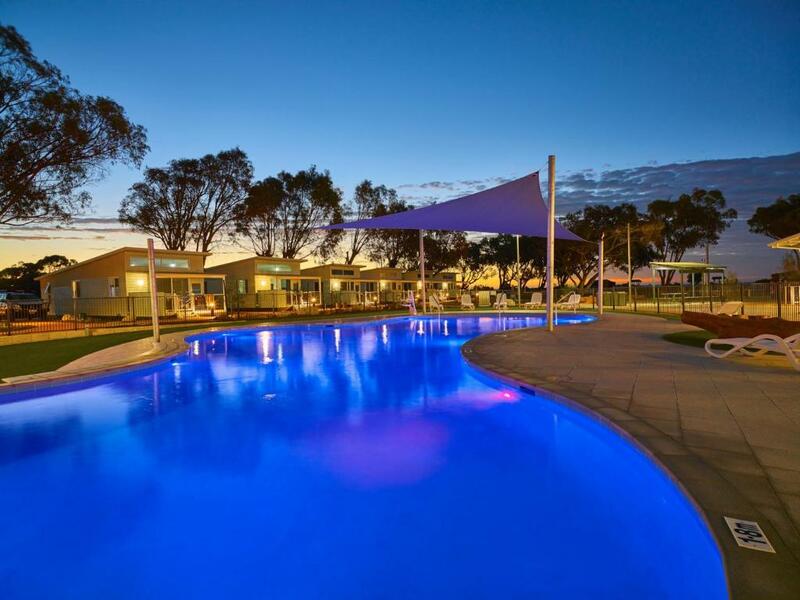 RAC Cervantes Holiday Park is proud to announce that the redevelopment is now complete. 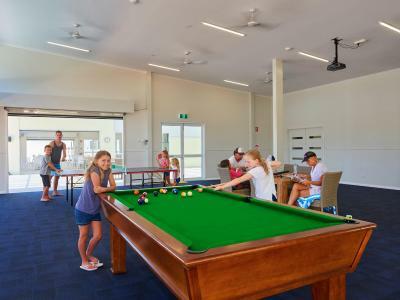 RAC Cervantes introduces a range of brand new 2 and 3 bedroom poolside villas, nature playground for the kids, BBQ area, sparkling swimming pool for the whole family to enjoy, kids’ activity area filled with pool table, table tennis, large screen TV’s and heaps more. Family holidays just got a whole lot better! 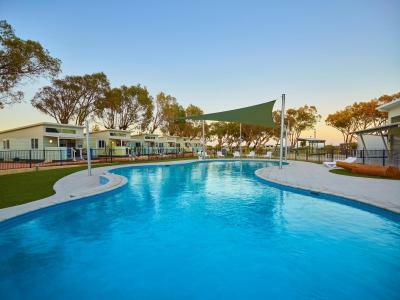 Cervantes is a perfect holiday destination to explore the natural beauty of Western Australia’s Coral Coast and outlying national parks. Located just a short 2-hour drive north of Perth and 2 hours south of Geraldton on the scenic Indian Ocean Drive, RAC Cervantes Holiday Park offers a convenient and relaxing destination for all travellers. Cervantes has so much to explore! The world famous Pinnacles limestone formations at the Nambung National Park, spectacular wildflowers, perfect location for kite and windsurfing, adventurous walking trails and abundant boating, fishing and swimming spots are just the beginning… Just want to relax? 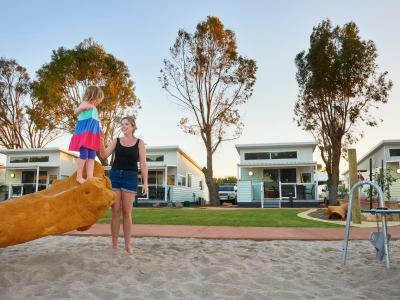 House Rules RAC Cervantes Holiday Park takes special requests – add in the next step! RAC Cervantes Holiday Park accepts these cards and reserves the right to temporarily hold an amount prior to arrival. Cervantes itself doesn't offer much in termes of shops / restaurants. Therefore think of packing some stuff before arriving. Table tennis bats were falling apart and there were only 2 so couldn't play doubles. Afternoon shade on verandah is a must! Bunk bed mattress on one bed was very uncomfortable. New areas of park are lovely, old ablution block needs renovating. Suggestion - shelter over the outdoor BBQ's Expensive! 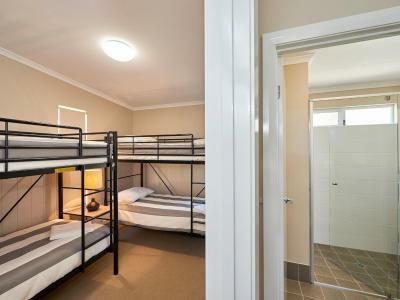 The room with bunkbeds could have done with a wall socket and side lamp. Beach was not so good. Since the houses are close to the swingingpool and play area, it tends to be a little noisy but then again it is a holiday park and this allows for keeping an eye out for your wee ones from the house.